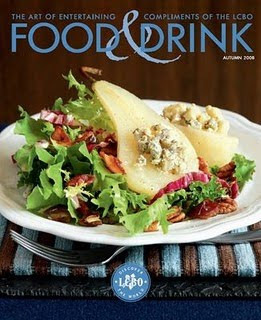 I don't know if you know this...but each season the LCBO comes out with a magazine called FOOD&DRINK. It's FREE and available at all LCBO's. For those of you who love new recipes or looking at great food photography you should check this mag out! It also has great ideas for new wines and also a section on how to make seasonally friendly alcoholic drinks! I would definitely recommend picking one up next time you are at the LCBO.